Today is the second and final day of Artsfest at Annmarie Gardens. 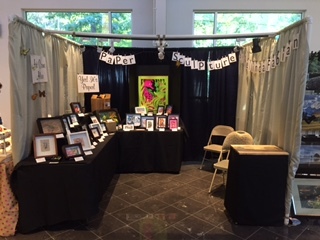 I got my booth set up, and the first day went well! If you’re in town, visit my booth inside (Booth No. 3)! The show runs from 10 a.m.-5 p.m. today, so there’s still time to stop by and say hello. Hope to see you there! I am in the process of getting my booth ready for the upcoming fine arts festival at Annmarie Gardens this weekend. I wanted a large, colorful piece of art to hang on the back wall of my booth. All of my paper sculpture illustrations are fairly small, so I needed to make something that would stand out and catch people’s eye as they enter my booth, but I didn’t want to spend weeks and weeks creating the art. Keeping with the paper theme, I decided to make a large paper silhouette. Using three different sheets of paper, I hand cut these colorful seahorses and fish. I used three different sheets of paper — bright yellow, pink and green — and then I attached them together to form one large poster. I think it will work great! I plan on hanging it up against my dark blue curtains in the back of the 10” x 10” booth. I only have a few days left to get ready for Artsfest at Annmarie Gardens, and I am still frantically working on my artwork. Here’s another piece, a crab paper sculpture. Mr. Crab is made out of paper and hand painted in watercolor and gouache. I only have one week left to get ready for Artsfest at Annmarie Gardens, and I am frantically working on my booth and of course artwork. Here’s one such piece, my seashells paper scuplture. All the shells and the sand is made out of paper and hand painted in watercolor and gouache. I don’t know if I’ve mentioned it here on my blog yet, but my son is a talented artist. (He even went to the same college art program and earned the same degree I did!) In my reorganized studio, I mentioned I was especially excited about my shelf, which my son, Ben (Fabian Design), made. 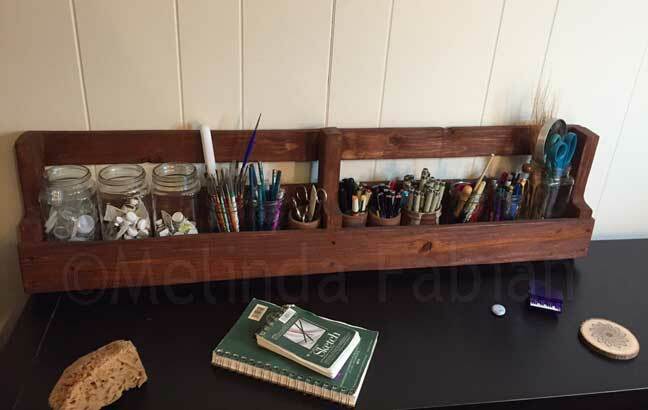 This wood shelf/organizer is working out great for me! It holds all my art supplies — my Winsor and Newton watercolor paints, Micron markers, paintbrushes, pens, pencils, scissors, magnifying glass, among other items. Finally, I have all of the things I need at arms reach and everything is in one place and in one location. 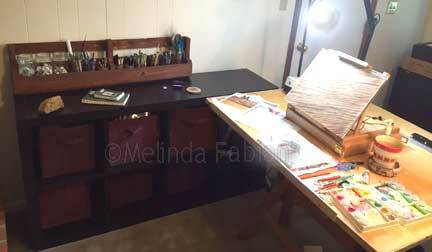 No more scattered art supplies living on my desk top, underneath a mound of papers, scissors or tubes of paints. I can’t tell you how much time I’ve wasted over the years trying to find a marker or my pencil or eraser lost underneath my painting or sketches on my own desk top. That can be very frustrating! The shelf holds glass jars I found at the local art store and keeps them contained all in one location. I also used some of the clay containers I made back in my college days, which just happened to also fit perfectly in the shelf. They are just the right size to hold my pens and markers. I like keeping the pens, pencils and different types of markers in separate containers so I can find exactly what I am looking for much faster. The clear jars are especially nice for the paints, and the little paint cups because you can immediately see what’s inside the jars. This is really going to help me keep my desk area clean and organized! It is perfect. If you’re interested in one of these beautiful shelves for yourself, or for other great creations, check out Ben’s Etsy page or feel free to reach out for his contact info!